I’m jumping right back into Time Management again this week, but I promise I have some other, non time managements posts planned for the remainder of the week. I started this series off with a printable to help create a Master Schedule To Do List, and I followed that up with another printable to help Prioritize the To Do List. Today, I’m sharing my next step. As I said at the beginning, I’m approaching organizing my time like I would any other organizing project. Lots of thought and note taking have been happening. I’ve also been analyzing my days a little more closer, looking for time wasters, peak times when I’m in the groove and getting stuff done, and times when I’m lost and not so focused. All this has helped me realize that what I really need to do is strip it all back to the basics. 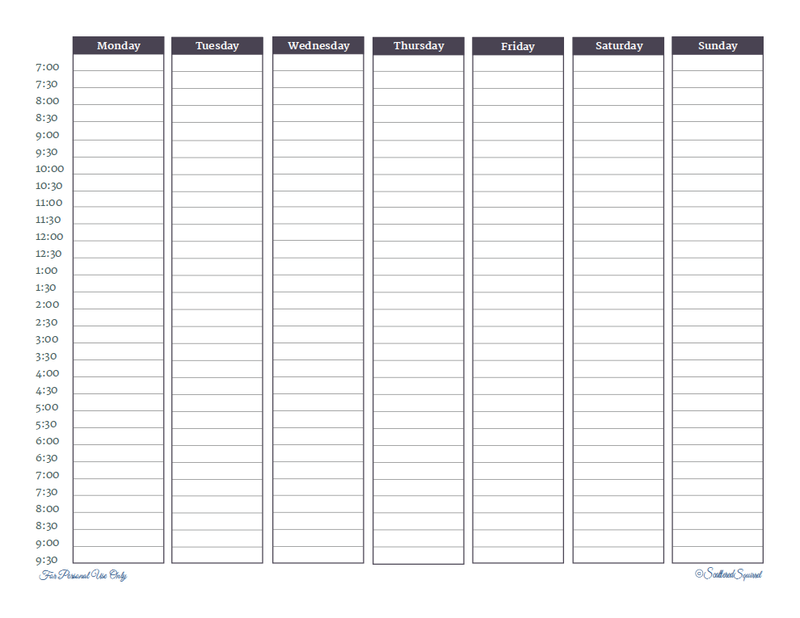 So here is the newest printable in the Time Management series. As always, you can just click the picture to snag a copy of your own. 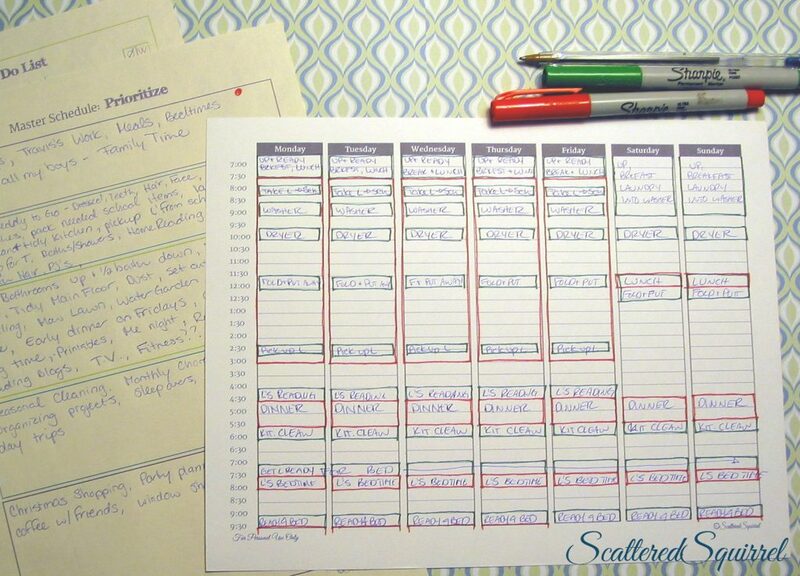 So, if you’re familiar with my printables, you probably recognize the weekly planner. I made it a little larger to fit in two more hours (7-8 am and 9-10 pm) and I changed the colors to greys. Now, I opted to go grey because it will be less distracting for this step. What I did next was simple. I assigned each category on the Prioritze printable a color. (I used colored sharpies, but you could use anything you want; colored pencils, other markers, colored pens, highlighters, heck even crayons) Then I started with category one, and outlined the time frames for the items in that box. Then I did the same for category two. I added in labels (I’ll warn you now, I wasn’t in “neat mode”) and called it done! Oh yeah, you heard read that right, done after only two categories. Told ya, it’s kind of messy, but it gives me a good idea of what I have to work with. Here’s a closer shot. To create a solid, but loose routine, I know I need to start with just the basics. I don’t need to start from scratch, I just need to solidify each stage, beginning with this one. Starting tomorrow, I’m going to take a week and just focus on these key areas. I’m not saying that I plan to do nothing else, I’m just not going to stress about it. I’m taking today to get all my weekly cleaning jobs done, and then I’m taking a week to focus on strengthening our morning and evening routines. Which is really what it boils down too. 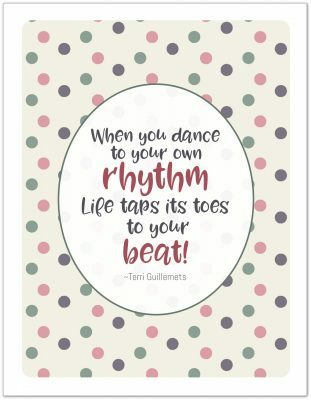 I also plan to pay close attention to my days, try to figure out my own rhythm, and find a way to make the best use of my time in a way that works best for me and my family. I’ll let you know next Tuesday how it goes this week. If you’re following along with the steps, and are going to take a week to just g back to basics, here are a couple of things to keep a look out for, what you fill your extra time with, and when you’re filling it. I often find that after I get back from dropping Liam off I’ll spend a half hour tidying up the house. Nothing specific just puttering, but I have a note of it for when it comes to add things back into my schedule. Same goes for times you feel a lack or energy or ambition. Make a note of those times, because when we start to add items back in, those might be good time frames for items on your to do list that don’t require a lot of effort or physical exertion. One more thing to watch for, since all we have to do are the basics for one week, is what chores you put off for the week. If there are any that you purposely avoid, make note of them because they’ll be getting some special attention. 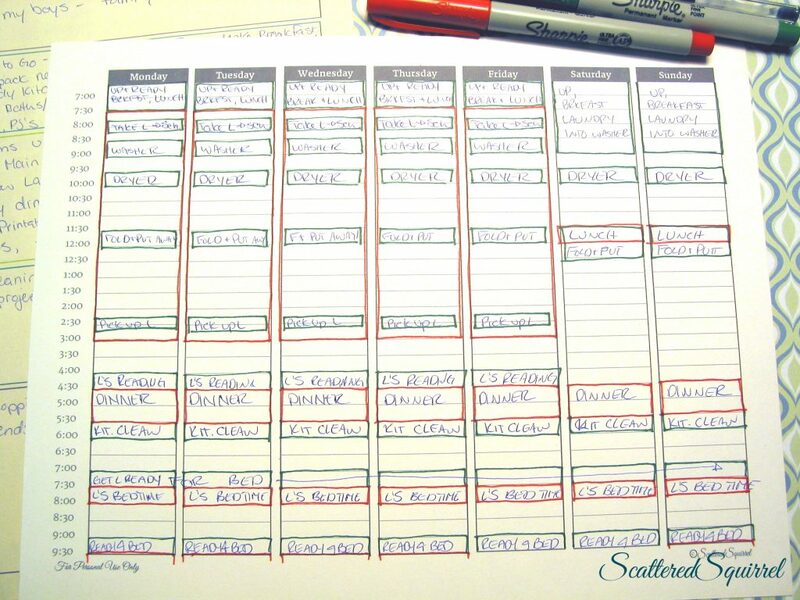 Has anyone else ever tried stripping their schedule back to basic to try to get a better handle on how you spend your time? What is one of the first things you would skip doing for a week? Thank you! This is a great series! I’m so glad you like it. I’m planning on an updated version later on this year, so stay tuned for that.